Beautiful dangle earrings created by Asprey in the 1980s. 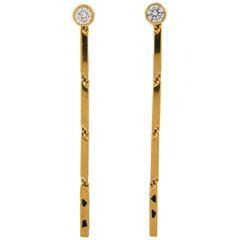 Feminine, stylish and wearable, the earrings are a great addition to your jewelry collection. 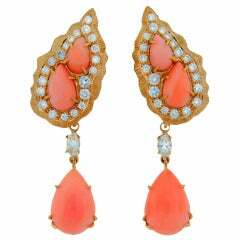 Made of 18 karat yellow gold, the earrings feature gorgeous deep red color Mediterranean coral accented with round brilliant cut diamonds (F-G color, VS1 clarity, total weight 2.30 carats). The earrings measure 1-3/4 x 5/8 inches (4.2 x 1.5 centimeters) and weigh 20.1 grams. Stamped with Asprey maker's mark and hallmark for 18 karat gold.